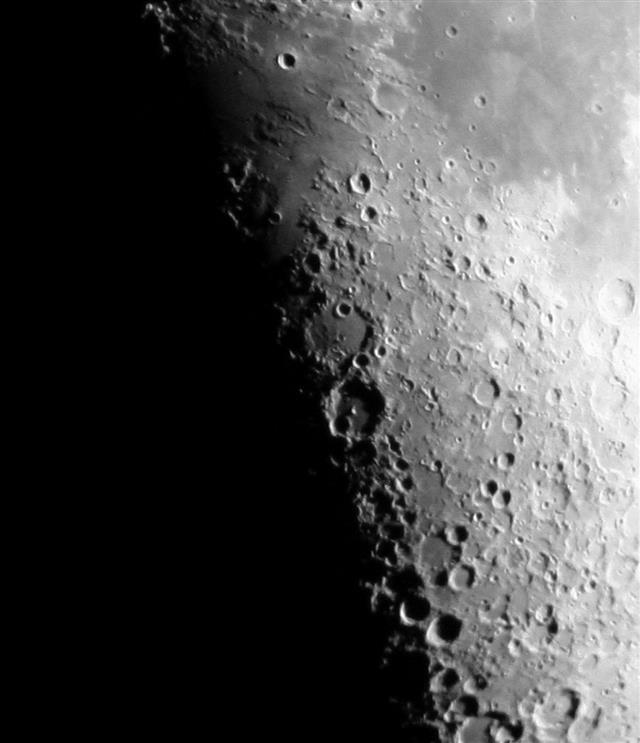 The Moon's terminator is a fascinating sight through all telescopes. Here, along the lunar sunset/sunrise line, lighting can strike familiar lunar features in very unusual ways, transforming them in ways that go unsuspected when the Sun rides high overhead. Such strange lighting effects are referred to by many as Clair-Obscur Effects. The term is adopted from an oil painting technique developed during the Renaissance that uses varying shades of colors and contrasts to create dramatic, three-dimensional effects. In painting, the Italian term chiaroscuro (translated light-dark) is also used often for the same technique. No region is richer in lunar Clair-Obscur Effects than the terminator on the night of First Quarter. Luna's brightness is not so overpowering that it dazzles our eyes, yet there is enough terrain showing that lets us enjoy its "magnificent desolation," as Apollo 11 astronaut Edwin Aldrin put it in 1969 when he became the second man to walk on that distant surface. As the Sun rises higher in the lunar sky, its narrow angle plays wonderfully against the rugged terrain. Most unusual of all is sunrise near the crater Werner. In August 2004, Canadian amateur astronomer David Chapman noticed an odd apparition along the First Quarter's terminator. Northwest of the crater Werner, which was just seeing sunlight at the time, Chapman saw an "X" seemingly floating in darkness, detached from the sunlit surface. His letter about the apparition that ran in the November/December 2004 issue of the Canadian astronomy magazine SkyNews started a flood of observations, photographs, sketches, and reports by others who excitedly saw the X. 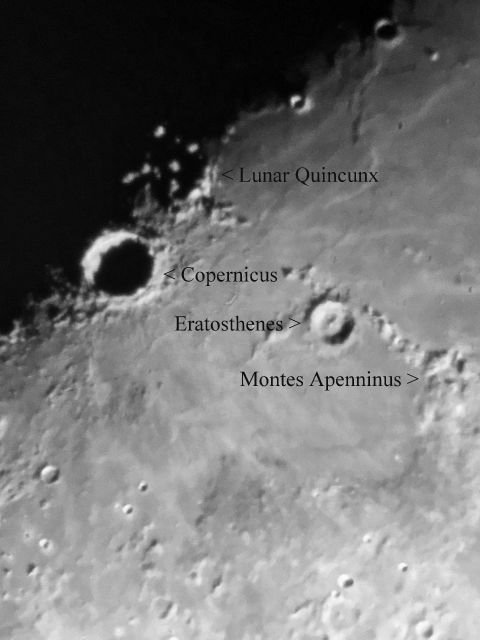 Above: Photo of the Lunar X, Lunar V, and Aries' Hoofprint. Credit: Dan Wright using the Westport (CT) Astronomical Society's 12.5-inch f/4.8 reflector and Canon EOS 300D. It turns out that Chapman's observation of the X was not the first. The formation is well seen on the First Quarter image among Lick Observatory's famous series of high-resolution lunar photos taken decades ago. This image has appeared in countless publications, including my own book Touring the Universe through Binoculars. But Chapman was apparently the first person to notice it and put a name to it. The Lunar X, also known to some as the Werner X, is easy to see as long as you are looking in the right place and at the right time. Timing is critical! 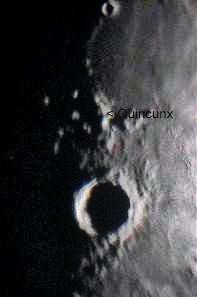 The X is formed by the confluence of four lunar craters: Purbach, La Caille, Regiomontanus, and Blanchinus. Purbach forms the eastern side of the X, while Blanchinus creates the western side. La Caille forms its northern boundary, and lastly, Regiomontanus marks the southern section. The X's namesake, 70-kilometer-wide Werner, does not contribute directly. Instead, as Chapman points out, "Werner is the closest well-lit crater and makes an obvious beacon for observers." Above: Finder chart for this month's Cosmic Challenge. Compare this chart with the photos above and below. Chart created using Virtual Moon Atlas software and adapted from Cosmic Challenge by Phil Harrington. High magnification is not required to see this unique lighting effect. I've had no trouble spotting it with 20x through a 4.5-inch Newtonian reflector. Indeed, it can even be seen through binoculars. But timing is important. If the timing is right, it's fascinating to watch the Sun rise over the X, slowly unveiling its ragged form over the course of an hour or so. The first rays catch the southeastern wall of Purbach. As the Sun climbs higher in the lunar sky, the X grows as Purbach's northeastern wall is lit, eventually merging with the southeastern rim to form one side of the X. The southwestern side of Blanchinus next sees the light, followed finally by La Caille to form the X. If you are a few hours late, the shadowing effect is lost and the X illusion disappears. While you're enjoying the X, be sure not to miss the Lunar V, which lies nearby. That's right, we have another letter of the alphabet visible at the same time just to the X's north. The V is sandwiched between Mare Vaporum to its north and Sinus Medii to its south. This puts it more or less smack dab in the center of the disk. The so-called Lunar V is formed by low-angled sunlight spangled across several small craters. The largest, 23-kilometer Ukert, forms a portion of the V's western edge, while a pair of intersecting ridges create the rest of the western edge as well as the eastern edge. Although the Lunar V is every bit as obvious as the Lunar X, it hasn't quite attracted the same level of attention among devout lunatics. Since both are visible at the same time, why not try both? Incidentally, Ukert displays an unusual V-shaped triangular floor after the Sun has climbed higher in its sky. Return here within a few days of Full Moon to see this unusual appearance. Finding tiny Ukert at this phase will prove very difficult, but patient searching at 100x or more should let you reel it in. The triangular appearance of Ukert's floor has raised the eyebrows of paranormalists and ufologists for decades. Could this unusual appearance be artificial?? Is Ukert an extraterrestrial construction site??? I guess you'll have to judge for yourself. As the X and V are drawing your attention, shift your concentration just to the east of the V and Ukert to a shadow feature nicknamed Aries Hoofprint. First mentioned by name a decade ago in an edition of Astronomy magazines e-mail newsletter, Aries Hoofprint is formed from an intricate combination of brightly lit mountains and dark lava channels. Some call this striking chiaroscuro the Horseshoe, while others prefer "Lunar Lips." If we want to alphabetize it, I supposed the Lunar U might be apropos. Personally, I favor the hoofprint analogy myself. 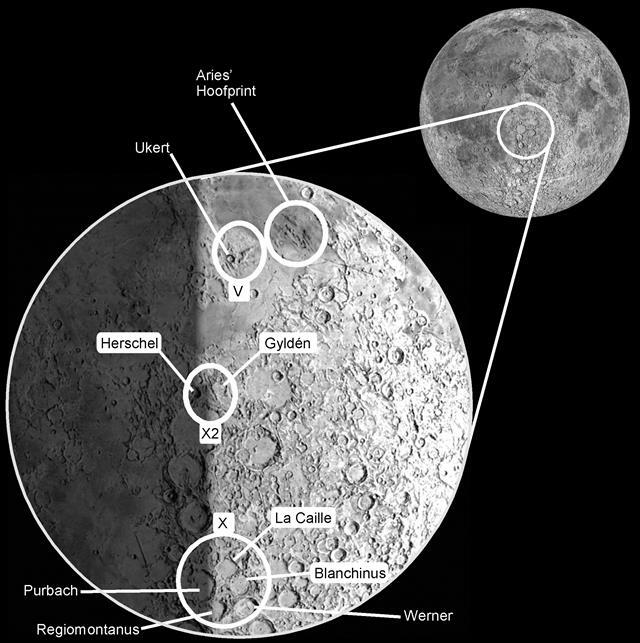 On older lunar maps, you may find the area labeled "Mount Schneckenberg," which translates to "Snail Mountain." 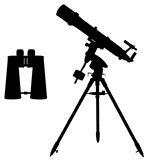 That odd name, bestowed by the International Astronomical Union, has since been retired. Finally, return to the area an hour or two past the Xs peak prominence and look halfway between it and the V. Can you spot a second X? Lunar X2 was first noticed by CNer Dave Mitsky from Harrisburg, PA. Back on February 17, 2013, he described a second Lunar X between the two other clair-obscur illumination effects. Referencing the Virtual Moon Atlas, it appears that X2 is formed by the craters Gyldén (to the east), Sporer (north), and maybe Herschel (west, in shadow). 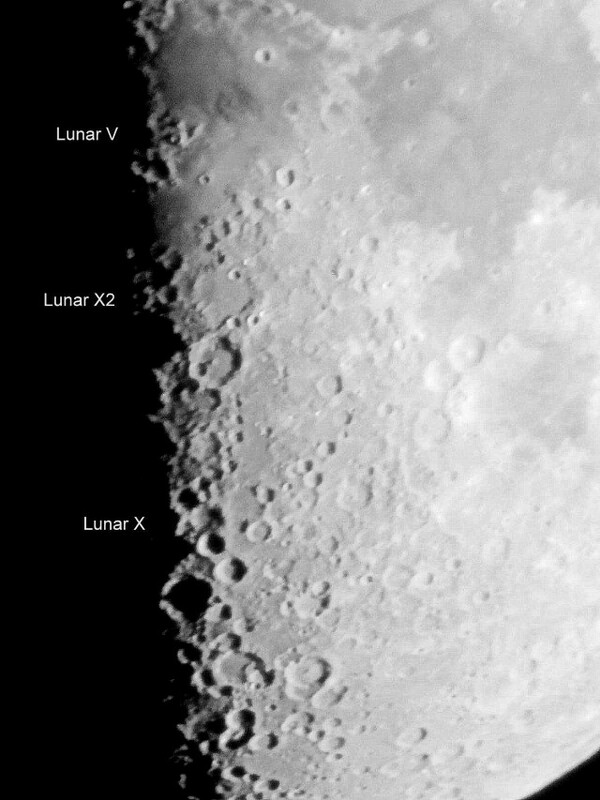 Above: Photo of the Lunar X, X2, and Lunar V.
Credit: Dave Mitsky using a 6-inch f/8 Orion SkyQuest XT6 Dob and a Canon PowerShot SD980 IS camera. The table below lists upcoming opportunities to spot all four of these Clair-Obscur features in 2018. The X and V will remain visible for up to two hours after the listed time, while X2 is at its best an hour or two past the stated time. The Hoofprint can be spotted up to an hour or so before the listed times and will remain visible for a few hours after. Note: The dates and times listed are based on calculations made with the Lunar Terminator Visualization Tool by Jim Mosher and Henrik Bondo. This useful freeware program may be downloaded from http://ltvt.wikispaces.com/LTVT. What other Clair-Obscur Effects have you spotted on the Moon? I'd love to hear about them, and possibly do a part 2 to this challenge sometime in the future. Drop me a line via my web site. Or better still, post your recommendations in this column's discussion forum for all to read. Thanks for using my photo, Phil! My pleasure, Dave. Thanks for discovering X2! Quincunx Spotted on the the Terminator! Thanks, Mike. I've seen the thread, but never your Quincunx. Named for five dots arranged in a cross, with four of them forming a square or rectangle and a fifth at its center. My new word of the day. Now, to work that into a conversation! Quincunx would probably only come into conversation if you play dice! The five on a die is a quincunx. Since reading this article, I'd been anticipating observing these lunar features. Last night (early 1/14/18 UT) it was clear in the Las Vegas area and I saw the U, V, and X in 60 and 80mm refractors, as well as shooting them with a video camera through a C14. It was a lot of fun to see them and not worry about dark adaptation and incidental lights from surrounding houses. The dynamic nature of the view was also interesting to watch as the sun slowly illuminated the features. The Moon was getting too low to see X2 but I look forward to seeing that, too, in the future. That's great! Glad you had a chance to catch the view. Unfortunately, the Moon had set here on the east coast by the time they all came into view, so I missed them. In fact, looking at the rest of the year, I don't I'll get a chance to see them, except possibly in daylight, until Dec 14. It's on my calendar, but my long-range forecast is for clouds. Here's a cropped image that I took that shows the Quincunx. I captured the Quincunx again on Tuesday night using my iPhone 6s and the ASH 17" f/15 classical Cassegrain. I believe I captured a photo of this feature but I am new to forums and technology in general. All I have is a cell phone and I am trying to post a picture. Can anyone help?